Grew Up… worshipping the Fighting Irish. Rudy and his family are die-hard Notre Dame fans, even though none of them ever attended the school. But going to Notre Dame as a student, never mind playing on its powerful football team, seems like a pipe dream for Rudy. Instead, he takes a job with his working-class father at the local steel mill after finishing high school. Living… on the cusp of his dream of playing for Notre Dame. Rudy moves to South Bend after a traumatic experience makes him realize he has no time to waste. He enrolls in a local community college with the hopes of making the grades to transfer into Notre Dame. If he does that, his plan is to make the team as a “walk-on” – the players without scholarships – just so he can say he’s part of the program. Profession… student doing anything he can to get closer to ND football. Rudy starts out working with the maintenance crew, tending the fields and sleeping in the maintenance closet while attending community college and fraternizing with Notre Dame students. Interests… what else: Notre Dame football. Rudy lives and breathes for the sport, and everything he does in his spare time – whether it be studying, working, or setting up his friends with dates – is a way to get a better shot at playing a game with the team. Relationship Status… engaged to his high school sweetheart Sherry. But he leaves her back home in Joliet when he moves to Notre Dame. Rudy doesn’t have much time or energy for romance these days. Challenge… proving his family, the team, and even himself wrong. After being denied his dream for so long, the odds are heavily stacked against him. To be honest, he’s too small, too slow, and not athletic enough to play at Notre Dame, but he hopes that his immense heart can somehow make up for all of those shortcomings. Rudy must fight with every ounce of strength he has to get on the football team. Personality… relentless and optimistic. Rudy keeps going even when everyone around him tells him he won’t make it. With an intensity that belies his small stature, Rudy is bemoaned by some players for making them look bad in the eyes of the coaches because he tries “too hard.” This intensity, coupled with a pride for his accomplishments, means that Rudy doesn’t take insults from naysayers kindly, and ends up in more than a few fights. Rudy goes to sleep exhausted but satisfied, ready to wake up and give it all he’s got to get a place on the field. 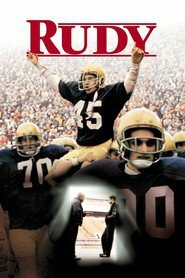 Rudy Ruettiger's popularity ranking on CharacTour is #3828 out of 5,000+ characters. See our top-ranked characters and read their profiles.